The interior finish of a pool lays down a waterproof surface over its gunite shell, but it can be much more than one of the final steps in swimming pool construction. Your backyard oasis is a welcoming spot for family fun and entertaining evenings, but it can also become a focal point that complements your home’s architecture and surrounding landscape. Our unique pool interior surfaces create underwater environments with subtle, bold or decorative accents from a wonderful selection of swimming pool finishes. Proven durability and underfoot comfort add to the long-term value of our industry-tested materials. From lovely flooring to perfectly paneled walls, the interior surfaces of your home reflect your good taste. American Pools & Spas offers that same opportunity to turn something special into something extraordinary with custom pool interior materials. Our installation services include expanding your outdoor decorating palette with swimming pool finishes in a beautiful variety of colors and textures. We work with the finest interior finishes specially manufactured to retain their good looks in any type of pool. The name of the company is call Wet Edge Technologies and they offer wonderful craftsmanship as well as high quality materials. Whether you enjoy salt or chlorinated water, our swimming pool finishes cover a wide array of styles and colors. Choose from soft pebbles, sparkling quartz or luxuriously polished surfaces. Wet Edge Technologies provides a selection with richly hued greens, endless shades of blue or tranquil aquamarines as well as sophisticated combinations of black with deep green or blue accents. Add a variety of aggregate sizes, patterns and base pigment colors to this creative mix, and your interior pool decorating spectrum is almost limitless. Before you make a final decision, we advise you on all the considerations that go into choosing swimming pool finishes. Pool water is crystal clear, but light absorbed and reflected by different materials gives it color. Landscape features and overhead trees add changing hues and shade levels throughout the day. Pool depth, size and underwater lighting are also important factors that affect your choice. Our expert design services help evaluate all the elements that combine to bring out the best in swimming pool finishes and your backyard setting. Our professional installations ensure that your swimming pool reflects the beauty you expect. We’re proud of our reputation for designing and building the best swimming pools in Florida. 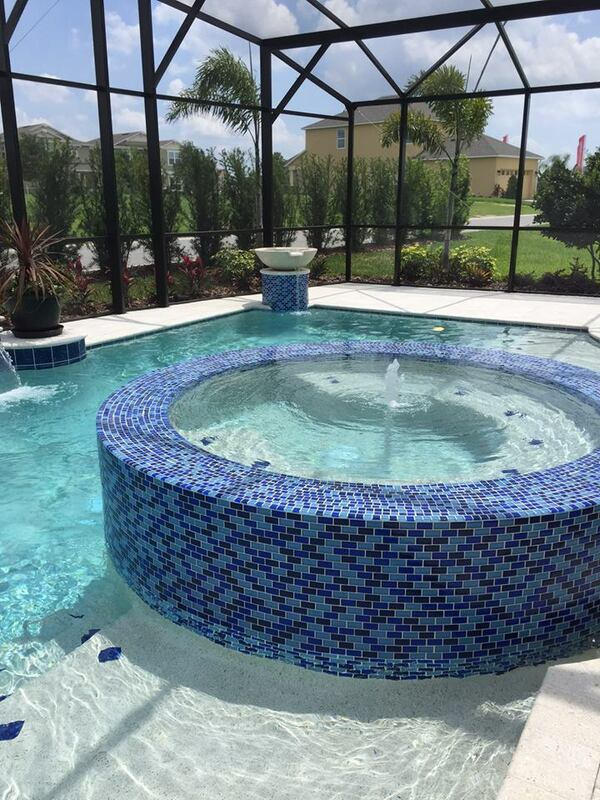 You can depend on American Pools & Spas to set your installation apart from the rest with interior finishes that complement exterior decor with your personal sense of style. Our estimates are always free, so give us a call today. You have our commitment to making your best swimming pool dreams come true.